Joe Furin stood at the east end of the Los Angeles Memorial Coliseum near the iconic peristyle, the collection of arches and columns that is the 95-year-old stadium’s defining feature. The historic stadium was in full construction mode and Furin, the Coliseum’s general manager, was going over the timeline for its $297 million renovation. The 18-month project is a tight one, but it’s on target to be completed for the 2019 football season, Furin said. At that time, the facility will have a new name, the United Airlines Memorial Coliseum, after the University of Southern California signed a 15-year, $70 million naming-rights deal with the airline in 2017. In June, six months after work started, the construction team of AECOM Hunt and Hathaway Dinwiddie had hit all of its benchmarks. They include constructing a temporary press box for the 2018 season, excavation for the new premium concourse supporting the seven-story Scholarship Tower containing a mix of premium seats, and steel erection for the tower. The renovations, designed by DLR Group, stand out as some of the coliseum’s most extensive upgrades. 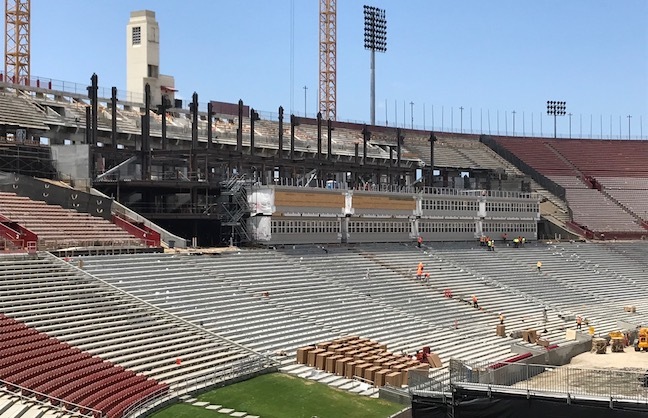 The tower itself will provide a true premium experience for the biggest donors and supporters of USC football, which has been the stadium’s primary tenant since it opened in 1923. The structure will contain 42 suites, 1,100 club seats and 24 loge boxes, plus a new press box and a 500-person rooftop terrace with bar stools, drink rails and shaded areas. The terrace has views to the game as well as downtown Los Angeles, the Pacific Ocean, Catalina Island and the San Gabriel Mountains. The new concourse, connected to a private entrance for premium-seat patrons, essentially runs the length of the south sideline. When it is complete, it will offer a much shorter way into the stadium compared with the old setup, Furin said. As part of construction, the grass field was removed so that graders, backhoes, trucks, trash containers and portable toilets could be moved in. A new field was to be installed in early July to get the playing surface ready for football season. A portion of the improvements were to be done by August of this year, with one-third of the seating bowl closed to the public for the coming season. Construction workers replaced 6,500 old seats with new chair back seats to accommodate Trojan Athletic Fund members. For 2019, the stadium will have all new seats with chair backs. The wider seats and the suite tower will ultimately reduce capacity to 78,000, down from 92,000 before the renovations. “It’s a little sweeter spot for hosting stadium events,” Furin said. The portable suites at field level in the east end will remain in place after the project is completed, but those at the top of the seating bowl in front of the peristyle will be removed to eliminate obstructed views of those architectural elements, Furin said. After being closed for seven months, the stadium will reopen Aug. 18 for the Los Angeles Rams’ preseason game against the Oakland Raiders. USC’s home opener is Sept. 1 against UNLV. The Rams enter their third of four seasons as a temporary tenant before moving to their new stadium in Inglewood in 2020. During his Clippers internship, Furin got to know building management, and over his last two years in college he fulfilled a paid internship. Later, he worked part time running the arena scoreboards, among other tasks. SMG had taken over operations of both venues, and Peter Luukko became the coliseum’s general manager in 1987. Furin graduated in 1989, and Luukko, now executive chairman of the NHL’s Florida Panthers and an executive with Oak View Group (VenuesNow’s parent company), hired him full time. Thirty years later, Luukko remembers Furin for his strong work ethic and his ability to get along with everyone, which is imperative for a facility manager interacting with the public as well as staff. As a full-time employee, Furin first worked in public relations before becoming an event manager. As he looks back, the 1987 appearance by Pope John Paul II that drew a crowd of 100,000 at the coliseum, the Rolling Stones stadium shows, Los Angeles Raiders and Clippers games and WWF’s heyday were early highlights for him. In 1994, Furin left Los Angeles and the facilities industry for 17 years. Initially, he promoted events across the country tied to motorsports publications. Living in Florida, he then took a job with Hello Florida, a destination management company. In 2011, as the Los Angeles Coliseum Commission was transferring stadium operations from the city to USC, officials called Furin to come back to L.A and help run the stadium, which eventually turned into a permanent position with the school. Now he’s leading the charge to bring the coliseum up to par with other restored vintage college football venues.